Some buyers found this IP camera hard to install and setup as it requires the knowledge of networking. The NetGear VueZone System comes complete with everything to set up own personal home security network. It just needs a high-speed internet connection and an available LAN port on router, along with a flash enabled web browser or compatible iPhone or iPad to access and view the cameras. With these innovative wire-free, battery-powered cameras, installation is easy by avoiding the hassles of running ugly power cords. The peel and stick magnetic mounts allow changing the camera location in seconds, making it very easy to manage. It is very easy to sync the cameras with one click and set it to start viewing live videos. This compact security system includes features like – watching live streaming video while on the go; set alerts and view captured video clips; record, playback and store video clips or photos; share live cameras and images easily; store video online for access from anywhere; pan and zoom on live view. Create a web-based online account at myvuezone.com and get a free plan with basic access, or the most popular Premier service that gives access to more features and supports up to 5 cameras, or the Elite plan for power-users, Vuezone has a service plan for everyone. However, some reviewers complained that the picture quality is grainy, requires improvement on fps and resolution and has access to lesser range. 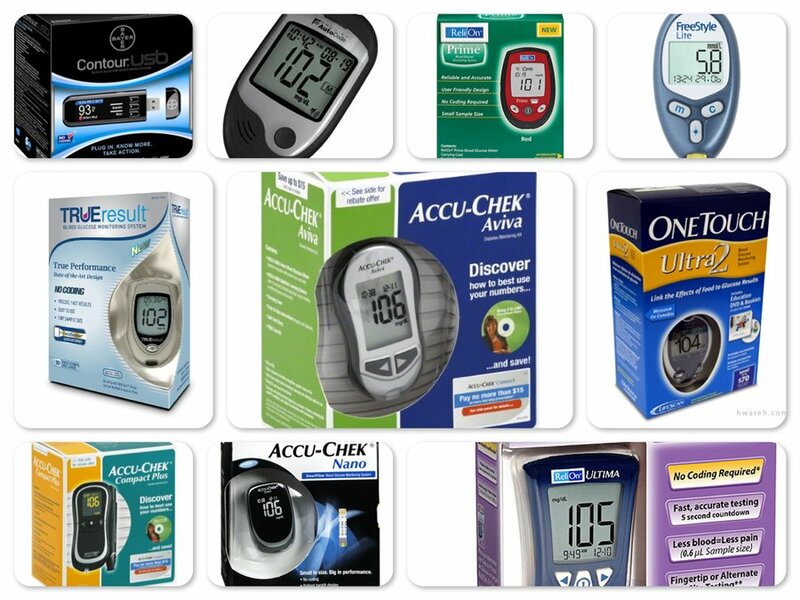 Also, another major concern is that this device does not perform well in low light areas and the batteries used in this device are not easily available. Overall, the NetGear VueZone System is an incredibly simple and convenient way to check on family, pets, kids, workers etc., and secure home. Overall, the NetGear VueZone System is an incredibly simple and convenient way to check on family, pets, kids, workers etc., and secure home. VueZone is live remote video right on smartphone, tablet or computer, providing complete peace of mind even on the go. 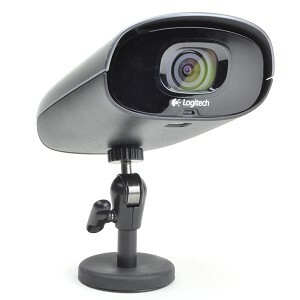 Logitech Alert 700e Outdoor Add-On HD Quality Security Camera with Night Vision is a weather proof high power camera. Its 130 degree wide angle lens gives twice as much viewing area as compared to other standard camera and it is useful for both outdoor and indoor locations. It’s a perfect surveillance camera which is easy to install. Its unique automatic alert gets activated when it detects a motion which can be seen on mobile devices with free apps and also on the computer. For more precise motion detection, and to reduce false alarms, you can specify up to 16 motion-detection zones within the frame- such as doors and windows. With a high quality and high powered night vision this 720p video camera identifies important details like facial features and license plate numbers with a better coverage despite of day or night, rain or shine and also the camera can be tilted, zoomed for a better view. The master system comes with Logitech alert commander, which is a powerful desktop app to manage the entire video security through PC via browser. Its 2GB micro SD can store recorded video for a week. This camera not only records video, but can be enabled to record audio as well. With Logitech Alert 700e, you can add an outdoor camera to your existing Logitech Alert master system for more complete picture of what’s happening in the backyard, driveway or dark garage when you aren’t around. The GE 51107 Smart Home Wireless Alarm System Kit is a 120-decibel alarm that sounds loud enough to alert anyone when a window or door is opened. 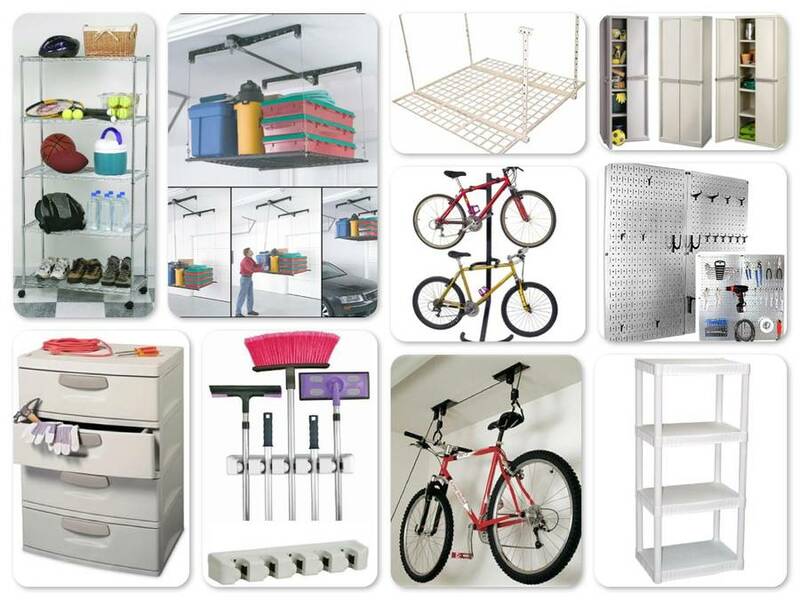 This system is easy to install with no wiring necessary. The big door alarm uses a 4-digit keypad to set the security code for arming/disarming and an alarm delay feature that avoids false triggering. In the 'Away' mode - it gives 45 seconds to exit the house after arming the system. This alarm needs to be deactivated within 30 seconds after getting back home with the custom 4 digit code. The 30-second delay helps to eliminate false triggering of the alarm. The GE 51107 Smart Home Wireless Alarm System Kit is a 120-decibel alarm that sounds loud enough to alert anyone when a window or door is opened. This system is easy to install with no wiring necessary. The big door alarm uses a 4-digit keypad to set the security code for arming/disarming and an alarm delay feature that avoids false triggering. In the 'Away' mode - it gives 45 seconds to exit the house after arming the system. This alarm needs to be deactivated within 30 seconds after getting back home with the custom 4 digit code. The 30-second delay helps to eliminate false triggering of the alarm. In ‘Home’ mode - simply select the home mode option for an instant alarm. 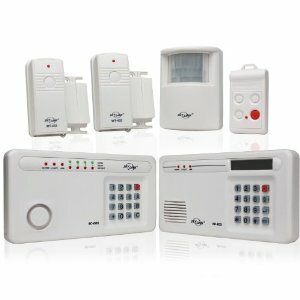 When not in 'Alarm' mode, all the alarms in the Alarm Kit offer a chime setting that alerts each time a door is opened. This is a great safety feature if you have small children that may make their way outside unsupervised. Each window alarm features an on/off/chime switch for easy operation and a battery-test switch for checking battery life. 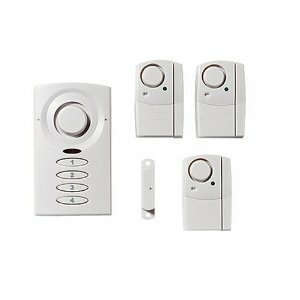 Each window alarm requires four LR44 batteries (included) that last up to a year and the door alarm requires 3 AAA batteries (sold separately). However, many reviewers faced issues when trying to get this unit work on metal doors or frames and also complained about the big door units malfunctioning. Overall, the GE 51107 Smart Home Wireless Alarm System Kit is simple-to-use and cost-effective security solution that helps protect against home invasions. 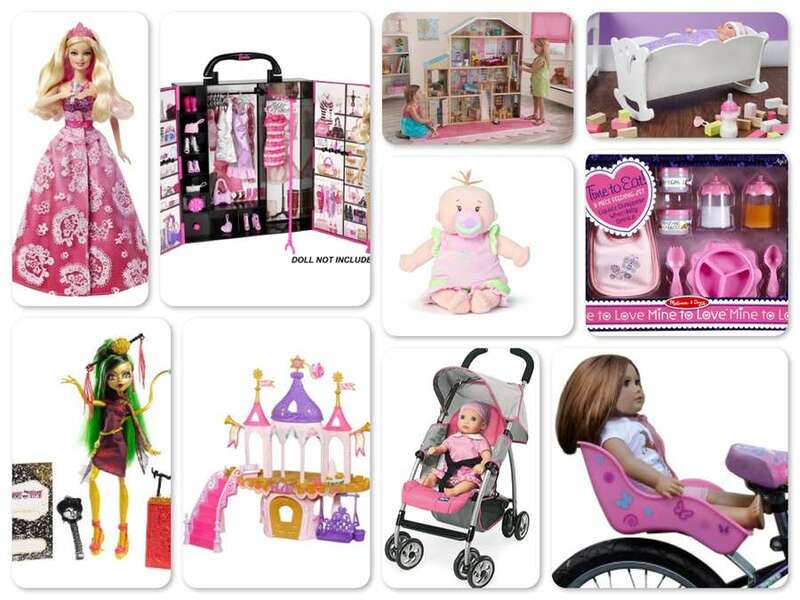 It is a recommended product from a trusted brand with affordable price and backed with 1 year limited warranty. Tons of features like motion detection, email, FTP etc. 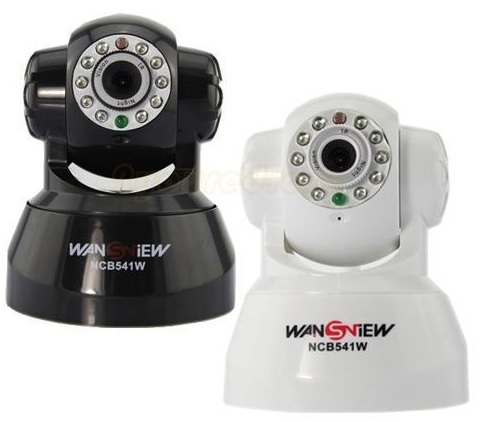 The Wansview NC541W Wireless IP Camera features M-JPEG compression format, support 2 way audio, WiFi, built-in Pan/Tilt and IR lights, mobile phone view, provide alarm in and out interface, support UPNP and PPPOE, motion detection, email, FTP alarm etc. In addition, it is smartphone compatible (Iphone, Android & Blackberry) as well as viewable over the internet network using the standard Safari browser (no app necessary). The camera functions well as an Iphone baby monitor or as part of a home or office security system with remote internet monitoring ability. It comes with an easy setup instruction manual, requires only power and network connections. If Wi-Fi is used to connect the camera, then only power is must. Through external alarm device, the alarm information can be sent to email or mobile phone. However, this internet surveillance camera requires a good knowledge of home networking and port forwarding to configure and install and therefore may not be easy to setup for some users. Overall, the Wansview Wireless IP Camera comes with loads of features at an affordable price. With built-in Microphone, it enables user to monitor the sound on the site. 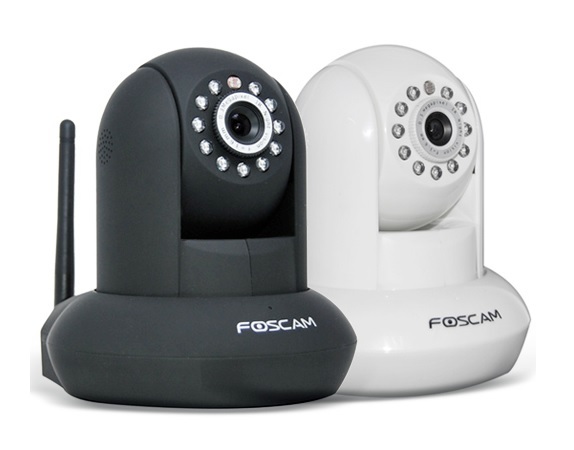 Overall, the Wansview Wireless IP Camera comes with loads of features at an affordable price. With built-in Microphone, it enables user to monitor the sound on the site. User can also connect this equipment to the speaker, and it supports two-way intercom function. The Logitech Alert 750e Outdoor Master System comes with everything that’s needed to help protect what’s important. It is a smart, weatherproof camera with wide-angle night vision, Windows and Mac software support and a free remote viewing account. With a choice of indoor or outdoor master system plus add-on up to 6 cameras in any combination or location, this is an easy set up device for surveillance. It also supports live video feeds from computer, smartphones, Ipad, Iphone or tablets. This device manages a vision up to 100 feet in complete darkness. Its 130 degrees wide angle lens and weatherproof HD 720p video camera with high powered night vision illumination makes it easier to recognize important details in all weather conditions. The Logitech Alert Commander Software give total control to watch/record/back up video with windows or mac computer and can reconfigure alerts and motion zones anytime. Tilt the camera, zoom in or pan around digitally to zero in on what’s happening and watch live feeds and review what’s recorded on all the cameras. This camera give the freedom to set motion alerts for various movements like – motion triggered alerts to email or phone, scheduled notification alerts or alerts for target vulnerable areas like doors or windows by specifying up to 16 motion-detection zones. The master system includes free remote viewing or logging in to Logitech’s secure site from any computer, laptop or phones. It has a built-in microphone which enables audio recording. It also has a built-in DVR and includes a 2 GB microSD card which is expandable up to 32 GB and can store up to a week of recorded video. It only records motion triggered events even when the computer is off and the recordings are automatically backed up on the computer when it connects to the network. However, there were many reviewers who complained about the motion detection mistaking rain and snow falling and sending alerts. It can be pretty annoying as the problem is particularly acute at night when the infrared illuminators are activated and triggers false alarms. 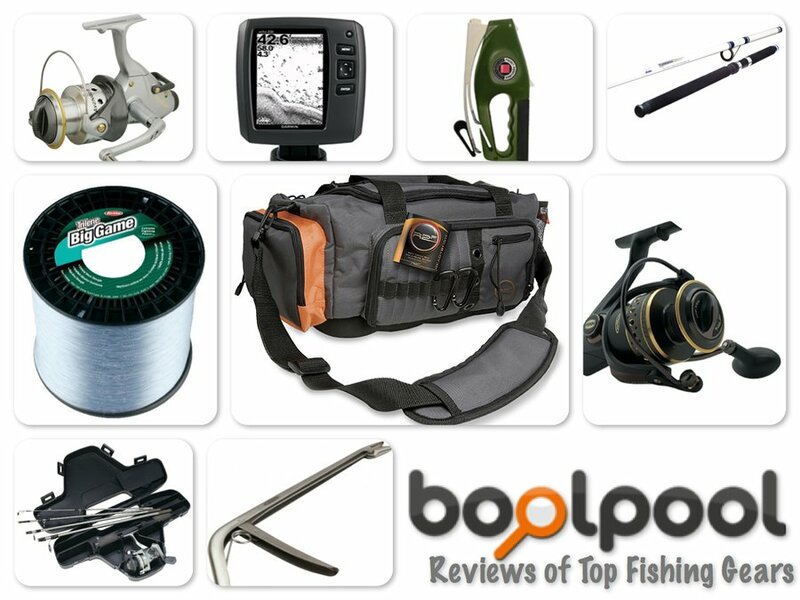 The software seems to be poorly designed and many users face sync issues with the camera and software. This device does not have continuous recording option and some users saw poor image quality and poor night vision quality issues. 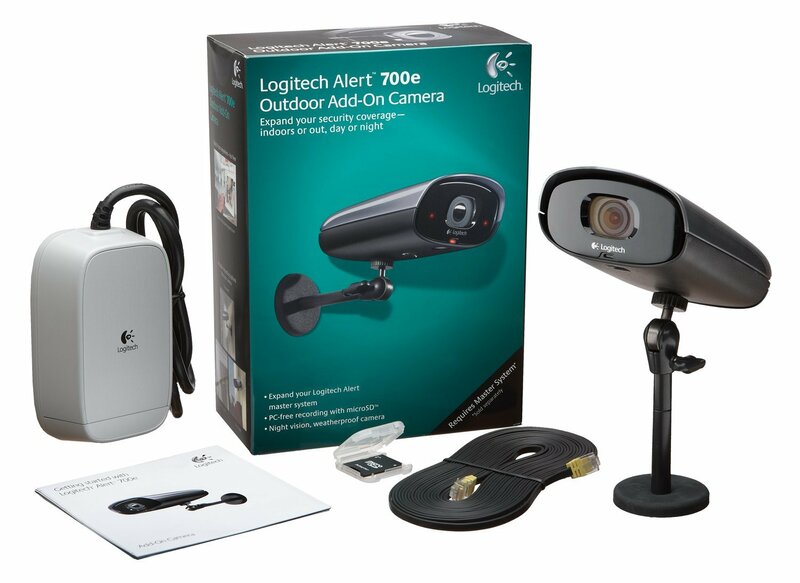 Overall, the Logitech Alert 750e Outdoor Master System is a simple, sleek, solidly made security camera system with good looks and affordable price. 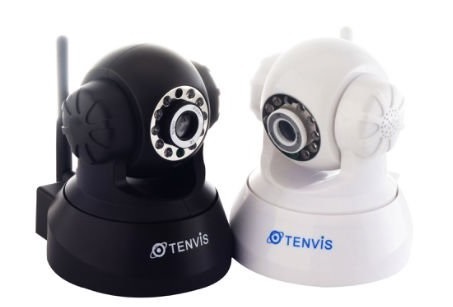 Tenvis Wireless IP Pan/Tilt/ Night Vision Internet Surveillance Camera is an entry level IP camera which comes with very durable plastic body. It consists of 10 infrared LED light and a power LED surrounding the lens. The speakers are located on either side of the device and the audio port, power port, LAN port and card slot are located at the back with a Wi-Fi antenna. The CD software wizard and little booklet manual with picture illustrations make it easy to setup the camera in less than 30 minutes. It is recommended to use Ethernet cable before attempting wireless setup for good and accurate results. With some port forwarding setup, the camera is ready for remote viewing on web browser (IE is recommended) smartphone, iPhone, iPad, tablets or Android. This pan/tilt camera produces good picture quality and focus can be manually adjusted by turning the ring around and night-vision works very well. This device is very much compatible with Blue Iris Software. Some reviewers complained about the short power cord and lack of control for IR LEDs. Overall, the Tenvis Wireless IP Pan/Tilt camera is easy to setup with DIY installation, friendly Graphical User Interface and unbeatable price for the quality features. This is smart way to ensure security within budget and it is backed with 1 year warranty. 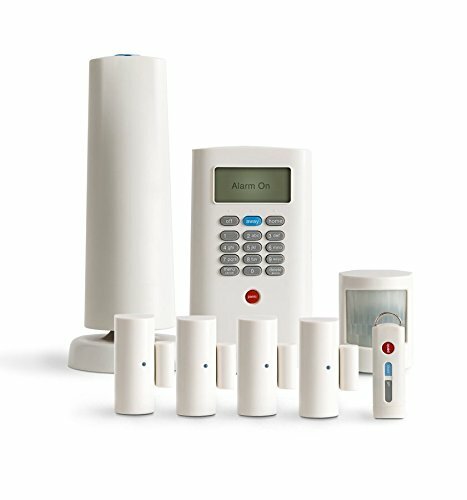 The Skylink SC-1000 Complete Wireless Security Alarm System kit is a comprehensive DIY wireless security system that is easy to install and ready to use. It is designed for a medium-sized house but can be expanded for businesses, offices, 24-hour stores, retail operations and more. Featuring rolling-code technology, this all-in-one system, offers a 100-foot operating range and requires no monitoring services or fees. The rolling code (or hopping code) is used in entry system that does not require a security code or key, eliminating the eavesdropper from capturing and using it to break in. This technology recognizes radio waves only from its remote sensor (door/window sensor, motion sensor and key chain transmitter) there by avoiding tampering of the system. Offering simple and straightforward operation, the SC-1000 features a lighted keypad that is easy to read in dark and offers Chime, Instant, and Delay modes. It runs on AC power with nine-volt alkaline battery backup (battery included), and provides a helpful low-battery indicator to prevent a loss of power. It works in conjunction with up to 30 Skylink security accessories including Dial Alert, Alarm Detector Sensor and Flood Sensor; this system can be customized to suit any needs and can be expanded to accommodate larger spaces that require higher protection. If any sensor is triggered when the system is armed, the included 110dB siren will make a piercing sound and immediately send a wireless signal to the system’s dialer. In case of emergency the system’s dialer will automatically dial the 9 pre-programed numbers (landline required) and play the pre-recorded message of 40 seconds to inform the recipient. The emergency dialer AD-105 is the personal monitoring center without any monthly charges. 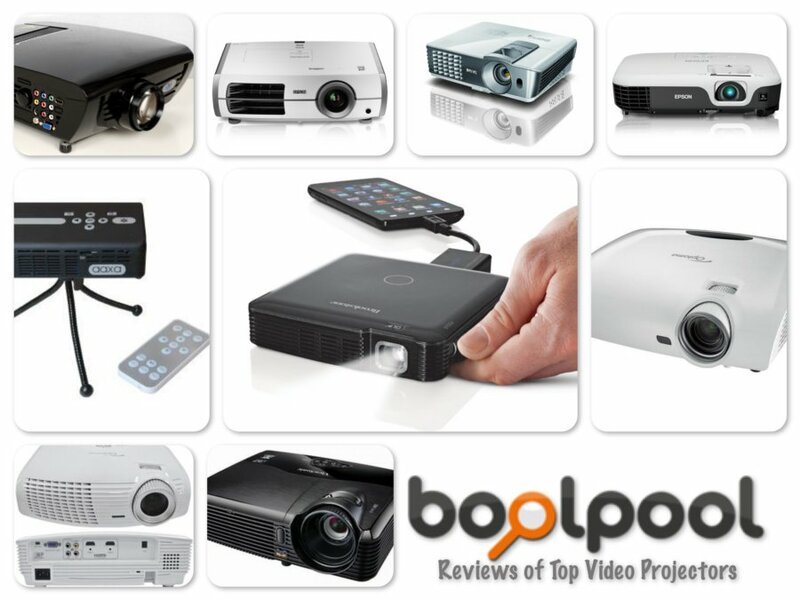 However, some reviewers faced some installation and incompatibility issues with new devices. 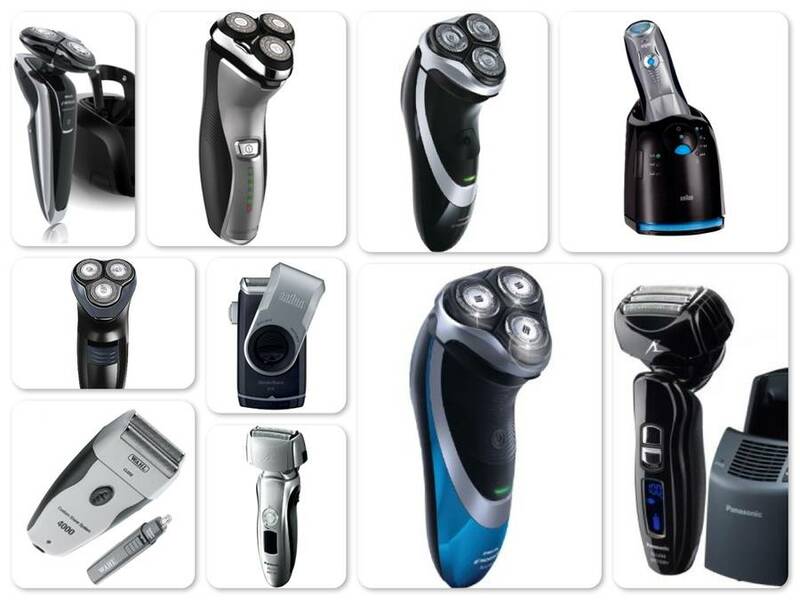 However, some reviewers faced some installation and incompatibility issues with new devices. Also some new orders arrived with no installation or mounting hardware to setup. Some reviewers complained about false alarms and suggested that adding an option to remotely turn off the false alarm via software would be an added advantage. Overall, the Skylink SC-1000 utilizes innovative technology with trouble-free wireless connections to provide security, making it a great choice for protecting against intruders and safeguarding in case of an accident, fire, flood or other emergency. 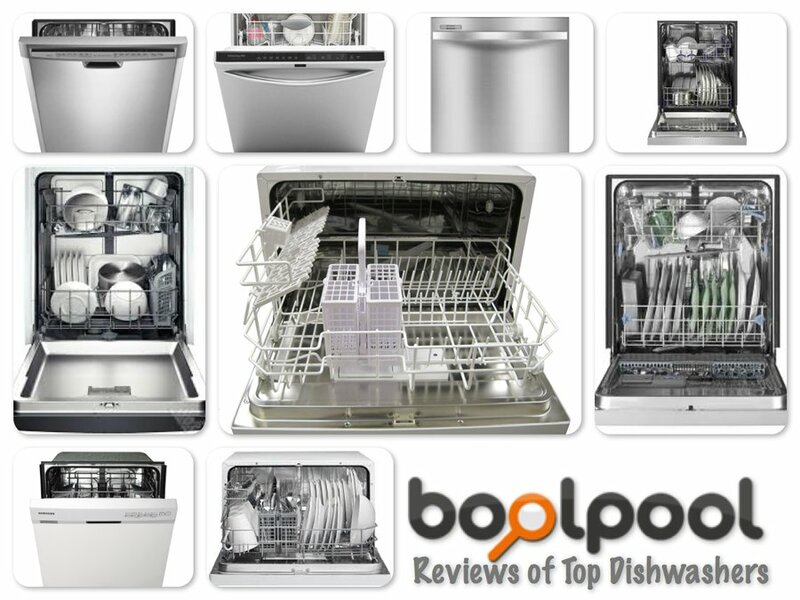 This is a highly recommended device with unbeatable price for its quality features. 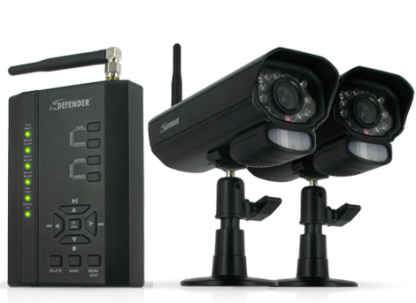 Defender's PHOENIX 301 System can be used to monitor and record video and audio in any indoor or outdoor space at any time of the day. The device comes equipped with Digital Wireless Technology that ensures there is no messy wiring involved when setting the system up. Built for indoor or outdoor use, the camera's durable aluminum housing resists rusting, deterioration and can weather any season. The attached sun shield helps prevent glare from the sun and other bright objects. The camera also has a built-in motion sensor to alert when motion is detected. This system can support a total of 4 cameras to monitor multiple offices, entrances and other outdoor areas. The compatible camera is Defender's PX301-C. This wireless plug and play system allows for easy set up in a matter of minutes and the included 2GB SD card can record up to 350 minutes of continuous audio and video footage. This wireless plug and play system allows for easy set up in a matter of minutes and the included 2GB SD card can record up to 350 minutes of continuous audio and video footage. The weather resistant cameras included with this system have 18 infrared LEDs that allow you to see up to 40ft away in the dark. The LEDs activate automatically when it gets dark, and deactivate during the day to save energy. 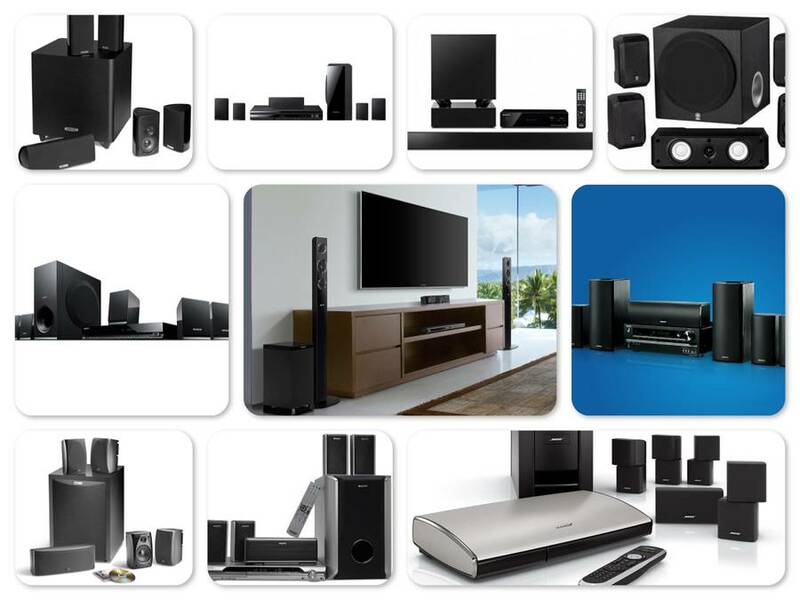 This system includes a compact receiver that easily connects to any television in home or business using the included 6 feet A/V cable and experience the convenience of watching the live or recorded video on any screen size. It also features an option to set the system to sound an audible alert to notify whenever a motion is detected within the range. The recording system allows to record video footage using three different types of modes: manual, scheduled and motion activation. This system also comes equipped with an IR extension wire which allows the remote control to reach further and make the system even more user-friendly. Some reviewers experienced that wireless connectivity range, does not match up to 450 feet as claimed by the manufacturer. It can manage a range of about 100 - 300 feet without any interference. A few reviewers also mentioned that the intercom or the two way audio feature fades or lags many times. Another problem mentioned by the reviewers is, it does not come with an option to zoom one camera at a time. The zoom option is applicable to ‘all or none’ which is a disappointment. 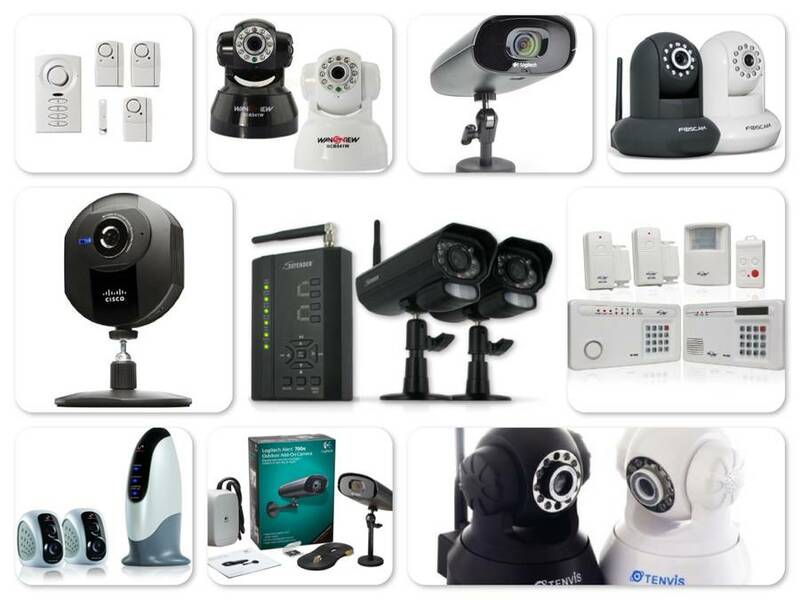 Some minor problems that are applicable to all home security systems like image clarity, lesser range or wider angle are also seen in this system. Overall, Defender's PX 301 System is ideal for monitoring entrances, backyards, valuables and employees, in any situation needed. This is a recommended system with perfect pricing for its perfect quality features backed with life time customer support facility. The Cisco – Linksys Wireless – N Internet Home Monitoring Camera is designed to send live video or images on computer or through the internet web browser or smartphone anywhere in the world. This compact, self-contained unit helps in keeping track of kids, workplace, monitor home, elderly people or anything else that is of importance. The wireless connectivity and sleek design makes it easy for placement anywhere – either mounted on a wall or using the included desktop stand, to enjoy peace of mind of reliable vigilance. This unit contains its own web server to connect directly to a network either through wired Ethernet or wireless (Linksys router is more compatible than any other router). The high quality and high frame rate video compression creates a sharp video stream. The real time feeds can be viewed on any network home computer, on the web or RTSP enabled smartphone when on the go. The high quality and high frame rate video compression creates a sharp video stream. The real time feeds can be viewed on any network home computer, on the web or RTSP enabled smartphone when on the go. In security mode, the camera sends an email alert with a short video of 5 seconds to maximum of 3 recipients whenever a motion is detected within its range. Depending on the situation or emergency, necessary action can be taken. This unit comes with 2 recording options – Live or on Pre-determined schedule and records the audio / video streams from multiple cameras to local hard drive or shared network with the included Viewer & Recorder utility. The camera can also record directly to a compatible NAS device. However, even though this unit comes from a well know brand it does have some disappointing drawbacks. The poor quality camera often stops working and requires restarting especially during auto recording on motion mode. Many have complained that this unit works perfectly fine when connected through wire or Ethernet cable, but fails to connect in most case wirelessly thus defeating the purpose of being wireless. Many reviewers faced difficulty in setting up the port forwarding for remote access for various reasons and it is important to be compatible with TZO service. Also, this unit comes with poor audio quality, especially during remote viewing and is not compatible with Androids devices. 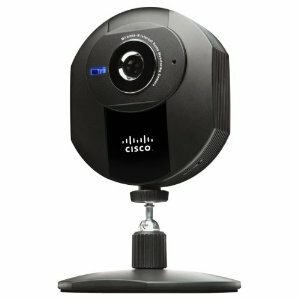 Overall, the Cisco – Linksys Wireless – N is an average Home Monitoring Camera to monitor the security of loved ones with a reasonable price. 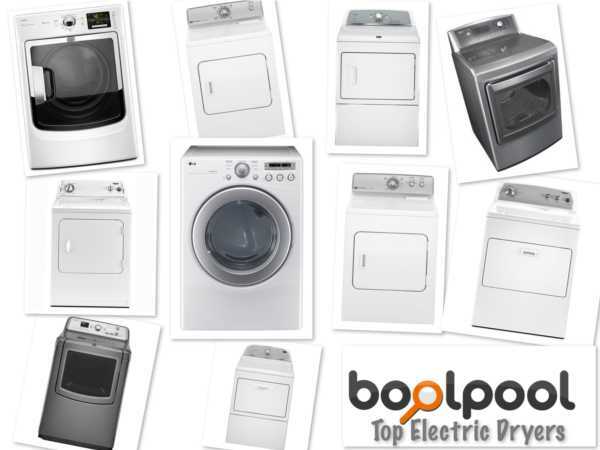 This unit is backed with 1 year limited warranty and a 90 days free complimentary phone or online chat support.